What Do You Say Heart ? Do You shy away from playing in the rain ? Do You Splash in Puddles too ? Do You Answer Your Own Questions ? Do You Look For More? Do You Know Your own Voice Yet ? A heart has no mind . So – Don’t Think .. So What Do You Say Heart? Do You Want To grow Up ? You Have found that Little space . It’s all Up To You . and Down To You . So What Do You Say ? Beautiful my sweet punkin. Love every word. I hope I know my heart. Even when it’s stormy. And yes I’ll play in the rain. It’s my refuge. Always has been…. P is for Punkin !!!!!!! You too my sweet. It’s going to be a scorcher here. Gotta get out and enjoy this life! It’s kinda cool and about to rain i think here ,………..
for me a quiet Day …. I just wrote YOU !!!!!!!!!!!!!!!! I have missed You ——- around WP ….. This is so beautiful, Cat! I love your choice of words in this one. I love the rain too, it’s another time for solitude, a place to feel all the stirs inside me. Love you Too Art heart sista ……. 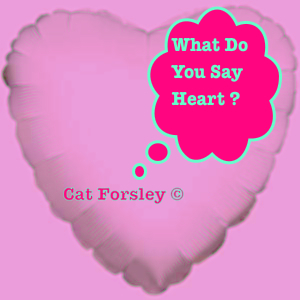 Yes heart – what do you say? bearman !!!!!!!!!! Funny You !!!!!!!!!!!!!!!!!!!!!!!!!!!!! Oh, and an award for you on my page! Thank You for Listening Linda …. This one should be your signature piece. I think it’s what you’re all about. Because your about 99% heart! Aren’t we all Binky ? Well, I don’t really think so, no. You’re much more heart than most. I think you may see that because You have the same kind of character ……? I wouldn’t say so myself, but I suppose it’s hard to see that of yourself. 🙂 I suppose yeah …! I just read you 0n email …………. I can only imagine your day job ——– !!!!!!!!!!!!!!!! judgement and hate are GROSS ……..
and You Love the world STILL !!!!!!! and You are such a beautiful soul ……..
Tell Your bro i say Hello ! and That it can only get better with time ….. So uplifting. Can I borrow your little voice to talk to my heart, too? What a wonderful gift you are able to give yourself and all of us. 🙂 Precious poem. So what do you say, heart??? This heart will be first in line 🙂 !!!!!!!! Puddle jumper from way back. Color: Orange. Space: Treehouse with the wind whipping through the windows. What does it say? Togetherness. i am the happiest Cat in the world . never felt like this before …………..